Symposium organizers are Okwui Enwezor (curator, critic, and poet), Hoor Al Qasimi (President and Director, Sharjah Art Foundation) and Salah M. Hassan (Goldwin Smith Professor and Director, Institute for Comparative Modernities (ICW), Cornell University). Participants include Frank Bowling (artist), Melvin Edwards (artist), Salah M. Hassan, Kellie Jones (Professor in Art History and Archaeology and Faculty Fellow, Institute for Research in African American Studies, Columbia University), Courtney J. Martin (Deputy Director and Chief Curator, Dia Art Foundation), Hoor Al Qasimi, Gilane Tawadros (Chief Executive, DACS and Vice Chair, Stuart Hall Foundation), Krista Thompson (Mary Jane Crowe Chair in Art History, Northwestern University) and Zoe Whitley (Curator, International Art, Tate Modern). For the symposium schedule, please click here. 5-plus-1: Rethinking Abstraction will focus on the implications of the original 5-plus-1exhibition, curated by Frank Bowling in 1969, making reference to the five artists who joined him in the exhibition: sculptors Mel Edwards and Daniel Johnson and painters Al Loving, Jack Whitten and William T. Williams. Bowling, the plus-1, questioned the role of art in society and the function of abstraction. In his career of six decades, Bowling’s engagement with history, migration, memory, and representation has continuously expanded the conception of what painting can be and for whom it is created. When he turned to activism in 1967, Bowling shifted away from the speculative realism of the figure, which underpinned his earlier work, and imagined a sensorial and visceral experience of painting, not only encompassing lived experience but also invoking memory, absence, loss, and exile. Revisiting the 5-plus-1 exhibition in this symposium becomes particularly significant in light of the rising interest in abstraction today as demonstrated by recent retrospectives and other exhibitions of work by abstract artists of African descent such as Sam Gilliam, Jack Whitten, Mel Edwards and Alma Thomas, among others. To contribute to this ongoing conversation, this symposium brings some of the major figures in Bowling’s 1969 exhibition together with a younger generation of scholars, artists and art critics to provide a platform for documentation and critical investigation of such a paramount period. Historically, the relationship between black artists who engaged with abstraction as a genre of painting or sculpture and those who preferred figuration as a mode of expression has been, at best, contentious. Figuration was preferred during the Black Arts Movement as a strong expression of the experience of racism and the struggle for justice and equality, while abstraction was viewed as less expressive of those realities and catering to Euro-American tastes. 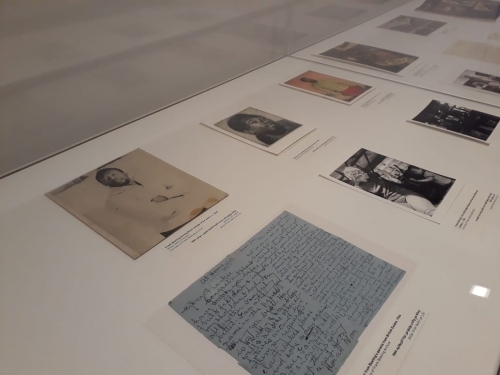 Yet, despite the dominance of figurative art, many black artists who were involved in the struggle and committed to activism did engage with abstraction in different degrees. Thus, the symposium will provide an opportunity for participants to focus on the historical tensions between abstraction and figuration in African Diaspora/black art and the debates around the issue. One facet of scholarship that remains scarce is work on important black women artists, such as Alma Thomas, Betty Blayton, and Mildred Thompson, who contributed to the practice of and discussions surrounding abstraction. The symposium will enable a critical investigation of abstraction in light of its gender dynamics from both historical and contemporary perspectives. Taking place at Africa Hall, 5-plus-1: Rethinking Abstraction will coincide with the exhibition Frank Bowling: Mappa Mundi at Sharjah Art Foundation, which presents an overview of major developments in Bowling’s practice across a six-decade career. The exhibition was inaugurated earlier this year at Haus der Kunst, Munich, Germany and traveled to the Irish Museum of Modern Art (IMMA), Dublin, Ireland before its Sharjah debut. Frank Bowling: Mappa Mundi is organized by Haus der Kunst, Munich in collaboration with the Irish Museum of Modern Art (IMMA), Dublin and Sharjah Art Foundation, Sharjah. The exhibition is curated by Okwui Enwezor with Anna Schneider at Haus der Kunst, Munich. The Sharjah presentation is co-curated by Hoor Al Qasimi and Okwui Enwezor with Anna Schneider.